To paraphrase the words spoken by Buzz Aldrin when he first set foot on the moon, the new trailer for "Apollo 11" is "magnificent resolution." Released on Monday (Jan. 28), four days after the documentary premiered at the Sundance Film Festival in Park City, Utah, the two-minute video offers a glimpse of some of the film's never-before-seen footage from the historic first moon landing mission 50 years ago. "The enormity of this event is something only history will be able to judge," says Apollo 11 command module pilot Michael Collins in the "Apollo 11" trailer. The film, directed by Todd Douglas Miller of Statement Pictures and presented by Neon and CNN Films, captures that enormity and reframes it as a cinematic journey told using only archival footage and audio. Disclosure: The author of this article, collectSPACE.com editor Robert Pearlman, served as the historical consultant on "Apollo 11." Like the film and its first movie poster, which was also revealed on Monday, the trailer opens with the Saturn V, the towering rocket that powered Neil Armstrong, Aldrin and Collins to the moon in July 1969. In a series of brief clips, the trailer shows the booster being carried out to the pad and igniting for launch between shots of the astronauts suiting up for the mission, all in spectacular 70mm format. The "Apollo 11" trailer also includes scenes capturing the activity inside the Launch Control Center at Kennedy Space Center in Florida and Mission Control at the Manned Spacecraft Center (now Johnson Space Center) in Houston, Texas. From the earlier, one particular scene centers on JoAnn Morgan, the only woman to work at a console in the Apollo 11 firing room. 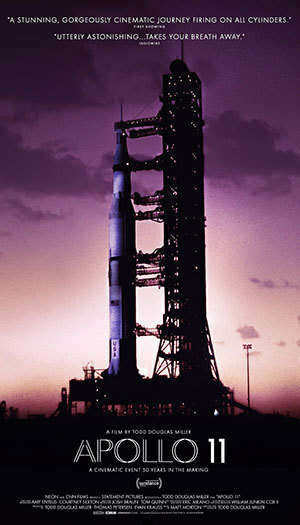 Miller and his team worked with NASA and the National Archives to source and digitally scan (at resolutions up to 8K) every available piece of footage from Apollo 11, including a previously unknown cache of wide high-resolution film documenting the preparations for the mission, the launch and the astronauts' recovery back on Earth. "Apollo 11" also incorporates newly-synced audio from an archive of 11,000 hours of recordings from inside Mission Control. Just before closing on the lunar module Eagle approaching a landing on the moon, the trailer turns its the focus back on us — the millions of people who stopped what they were doing to watch the mission unfold. The scenes of spectators and space program workers are set against the on-screen words, "witness the last time we were one," a reference to what President Richard Nixon told Armstrong and Aldrin during his call to the astronauts on the lunar surface. "Apollo 11" is coming soon to theaters.